The first round of the Summer Cup is on February 11th. The Provisional Draw for grades A, B and C is linked below. For D grade we had a large number of entries so are short of space. We are setting up some temporary tables but it is possible some players may have to wait to start their games. Due to lack of space no further entries will be accepted. A reminder that if you are in D grade and unable to play on a Monday you must txt Simon (or inform Ying Wang) before 6:45pm. If you do so you/your child will get a half point bye. If you don’t inform ahead of time then you will get zero. People who regularly don’t notify absences may not be able to enter events. If you are in a Round Robin grade you are expected to arrange an alternative day with your opponent and then inform Simon. The Summer Cup starts on the 11th of February. We are close to full and any entries received after Feb 5th are not guaranteed a place. Second place was Euan McDougall (who gain 100 FIDE ratings points in January) with 7.5 while Alex Nagorski was 3rd on 7 points. We had several new players at the club. David McNeil from the US was visiting for the evening. Nigel Metge and Ajit Pendharkar both return to regular play. While Michael O’Callahan, Eden Oshri plus Grayson, Tyleah and Hunter Po’e-Tofaeono were all starting out. Due to a clash with the NZ Chess Champs the Simil at the Club on the 21 st of January has been cancelled. Instead the first event for 2019 will be on the Blitz Championship on February 4th. Entries for The Blitz and Summer Cup will be up soon. A Rapid tournament for 2-person teams. The last round of the Spring Cup saw fewer draws and upsets than previous rounds. 2018 Spring Cup R7 PGN by Ewen Green with help. With Paul Garbett’s win in the last round he pulled ahead of Alphaeus Ang and Daniel Gong (both overseas) to win by himself on 5.5 points. 2nd equal on 5 points was Daniel, Alphaeus and Mike Steadman. Aaron Wang vs Lakshmi Ravi – The players swapped down to an endgame. Black was better but missed the winning move and the game was drawn. Winner of B Grade was Virginia Milne on 6 points (a Swiss Gambit). Third equal on 5 were Jeffrey Yu, Arkadi Polyakevich and Boyuan Zhang. Just two more weeks of Club to go this year. 2018 Spring Cup R6 PGN by Tim Ha. Alphaeus Ang vs Daniel Gong – White had a better position at times but was unable to exploit it and the players swapped to a Draw. Paul Garbett vs Ben Hague – Black mounted an attack on White’s King. White defended well but decided to take a draw rather than continue. Draw. Bruce Watson vs Mike Steadman – White game up a pawn in return for a great outpost Knight. But he failed to find the best continuation and his advantaged petered out in a sharp position. Black managed to force a perpetual check. Draw. Three draws on the top three boards just further squeezed the field. Three players are on 4.5 and 2 more on 4 points. Final Auckland tournament for this year is the Papatoetoe Rapid. There is Rapid on Saturday the 1st of December and another Junior Rapid on the Sunday. Entries online here. 2018 Spring Cup R5 PGN by Ewen Green and Alex Nagorski. Mike Steadman vs Daniel Gong – White played 1. e4 for a change and got an equal opening and picked up a pawn in the middle game. But he was unable to find the correct move to open up Black’s position and settled for a draw. Alex Huang vs Alexei Kulaskho – White picked up a great outpost Knight and pushed a rook though to the 7th. But Black swapped out the attackers to equalise. The position finished with neither player able to break though a wall of pawns though the middle of the board. Draw. Paul Macdonald vs John Duneas – Black gave up a pawn for little compensation on move 3. He mounted an attack but didn’t make a lot of progress and lost another pawn. However somehow black got back both the pawns going into the endgame. The players drew with equal endgame. Simon Lyall vs Clinton Wells – A fairly even game, neither player managed to get significantly ahead. A draw agreed in an even endgame. Alex Huang drew with Alexei Kulashko. Draws on the top three boards left the placings the same. Ang, Garbett and Gong on 4 with Steadman on 3.5. 5 players are on 3 points. With his win Stephen Peters is in Sole lead on 4.5 points. In 2nd eual on 4.0 points are Arkadi Polyakevich, Sarah Yan, Jeffrey Yu and Virginia Milne. The field is starting the spread out in both grades. Alex Nagorski vs Lewis Jordon – Black forgot his lines to give White a better opening and White was ahead and attacking. But White miscalculated and lost an exchange. He was able able to defend his position and Black settled for a draw. Paul Garbett, Daniel Gong and Alphaeus Ang lead the grade on 3.5 points. Mike Steadman is just behind on 3. 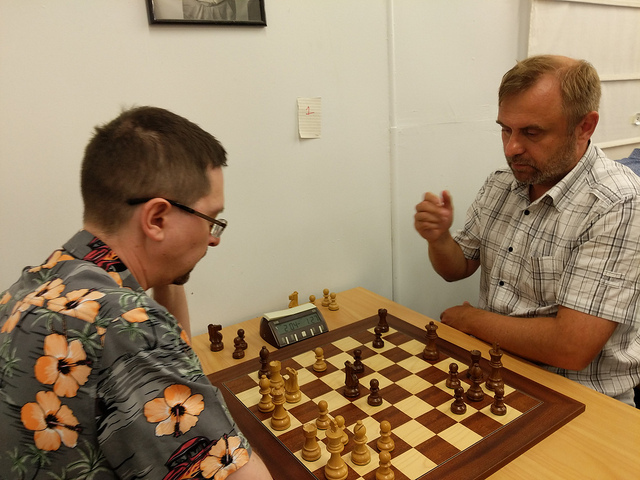 Arkadi Polyakevich vs Stephen Peters – The players swapped to an even position and took a draw. Stephen Peak vs Ravi Lakshmi – The players swapped to an even position and took a draw.